Front Row: Mary Helen Howard, Reuben Mast, Donabell Murphy, Don Yeiter, Ramona Collens, Richard Harmon, Edna Marie Bennett, Charles Griesinger, Betty Mae Rohrer, Avis Beach, Howard Konkle. 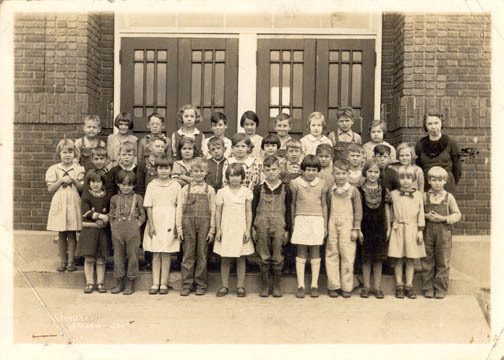 Second Row: Barbara Clark, Paul Weaver, Teddy Harman, Willard Leazenby, Charlotte Clark, Earl Yeiter, Vera Jean Huffer, Louise Stookey, James Weaver, Laura Mast, Paul Riley, Harold Gerard, Marie Messmore. Top Row: Jack Powell, Romance Howard, Lester Vandermark, Ida LaBelle Powell, Stanley Heckman, Joyce Collens, Gene Messmore, Joan Martin, Leonard Konkle, Catherine Martin. NOTES: Charles Griesinger, the only one who made a perfect score on 3rd gr. exam.